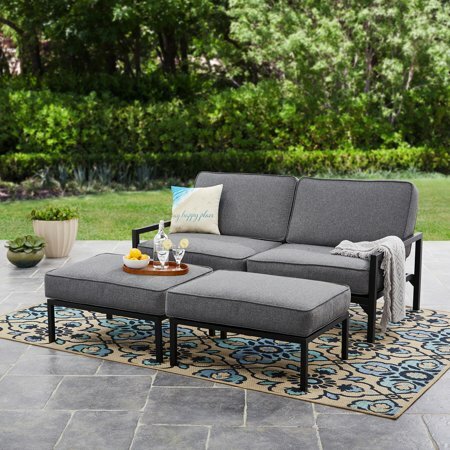 Our Mainstays Moss Falls 3-Piece Sofa-Daybed Set is the perfect centerpiece or complement to any Outdoor Oasis if you're looking for a modern and sophisticated aesthetic. This Daybed Set is not only chic, but, also remarkably comfortable — think college futon, but, tranquil. The Daybed/Loveseat features an adjustable back with 5 positions and lies completely flat. The plush cushions feature a smooth yarn-dyed crosshatch woven fabric for extreme, sustained relaxation. Additionally, our cushions are self reversing, and have Velcro tabs for quick and trouble-free cleaning and they won't blow away in a strong wind! The Daybed/Loveseat has been tested to hold up to 500 pounds and all of the frames are constructed using powder coated steel for durability and to resist rusting. The Ottomans feature the same plush cushions as the Daybed/Loveseat and are fully welded, which means no assembly is required. Features an adjustable back with 5 positions and lies completely flat. This outdoor sofa is awesome! It was super simple assembly (12 bolts), and it is very comfy. I was pleasantly surprised for the quality in its price range. Mine is in a screened in porch, so it will not be in the rain. I don't believe I would feel good about this fabric outside in the weather. It would be one of those you take the cushions inside and store between uses. It took my husband and me less than 30 minutes to assemble and then relax on it with some cold snacks. =) I don't ever want to leave my porch now! The guy who delivered mine put it up on my front porch, and my house is on stilts. Once I felt how heavy it was, I was EXTREMELY thankful for that! Be sure to have help moving the box. Great size! Nice and large with deep cushions. Super thick comfy cushions. Love that you can recline this down flat into a bed or about 5 different reclined positions (so easy my 4 year old was able to do it). You can easily fit two adults lounging comfortably on it. Nice neutral modern color and quality fabric. I was impressed! The sofa is just short of 71 inches long and about 35 inches deep. It sits pretty low on the ground and is super comfortable. Very gray though. Definitely a more modern look. Each ottoman is about 34 by 24. BIG set. Love it, what a value! Easy to put together, the ottomans are already together, the sofa just needs the side pieces and the suport leg in the middle; 12 screws all together. Plastic on the legs so it doesn't scratch the floor. The ottomans are entirely made of metal. The frame of the sofa is made of metal, and the back part is a screen type of material. 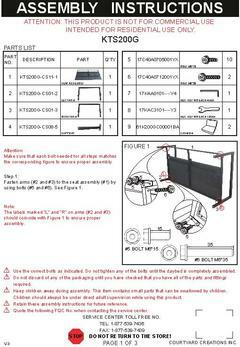 The screen is put in with screws so theoretically if it ripped, it would be easy to replace. The weight of 250 is for each separate side of the sofa, (with separate labels) so total weight is 500 pounds. The seats have to go all the way down before u can ratchet them up to position. Works fine so far. Wow. One finicky thing, the foam in the pillow were a little misaligned, I have to readjust. But very minor complaint.